The property of approximately 500 square meters is built on a single level: the right wing building and the left wing building joined by a patio with a large panoramic terrace overlooking the Sea where You will be able to dine enjoying the Mediterranean Sea breeze and an incredible 270 degrees view of Porto Rotondo, the Island of Mortorio and the Cala di Volpe Bay. The new magnificent temperature controlled swimming pool with sea water and the private access to a very secluded beach make this property the premium choice of the entire Costa Smeralda according to the teNeues book “Best Places to Rent on the Planet“. Four more secluded sandy beaches can be reached in walking distance and from the private dock you can quickly and easily reach with a fast tender all the incredible beaches of the area plus the Cala di Volpe, Pitrizza and Romazzino Hotels, Porto Cervo and Porto Rotondo marinas with their exciting shopping and Glamourous Costa Smeralda night life ! 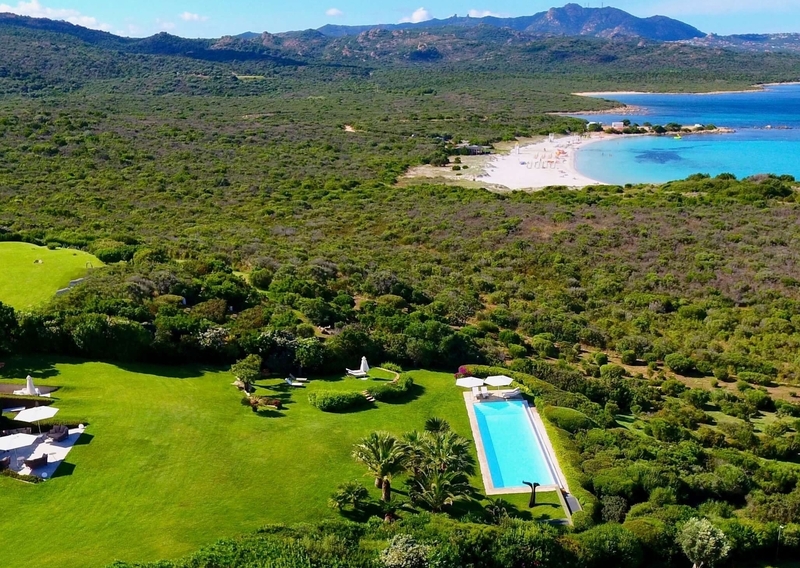 Beautifully situated between Porto Cervo and Porto Rotondo and designed by the famous architect Ferdinando Fagnola, the villa seems to blend into the green hills above the Costa Smeralda so seamlessly that it is scarcely noticeable from sea. Protected and yet flooded with light, constructed of concrete and yet colorful, the design skillfully combines what seem to be opposites. This magnificent Villa is located between Sardinia’s most famous Resorts, Porto Cervo and Porto Rotondo, both of which are only fifteen minutes away. 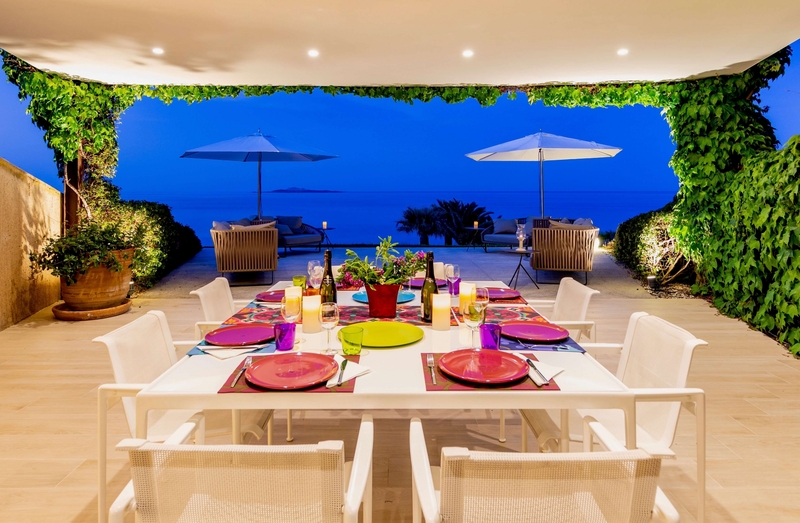 The villa has a fantastic 270 degree view of the Mediterranean. Mooring on its new private dock and use of a jetty in front of the villa is no problem so that shops and restaurants are just a few minutes boats ride away. Guests will enjoy not only the exquisite and uninterrupted view of the Mediterranean, but also the unique design that is almost imperceptible from the sea blended with the nature of the large garden and the flora. In Winter 2017 the owner has refurbished all living and outdoor areas of the house decorating interiors with taste, elegance and the latest hi-tech equipment like Home Cinema Surround System, Satellite and Sky Tv, WIFI, house PC+printer etc. 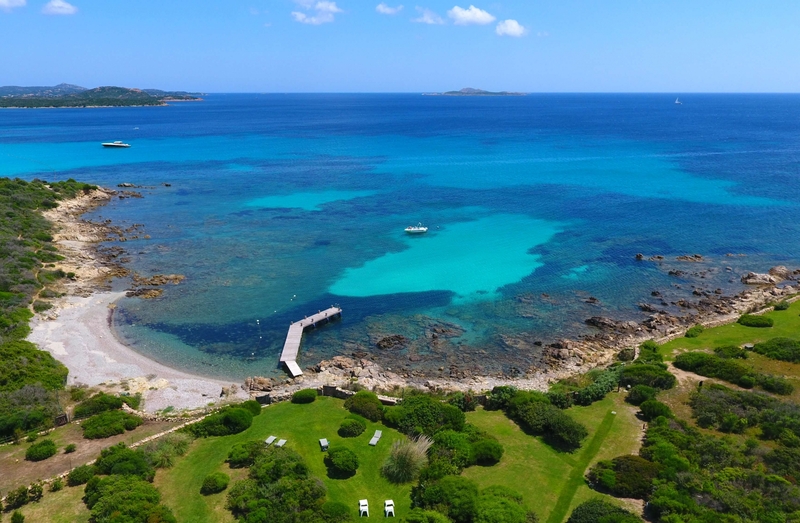 The twenty meters temperature controlled swimming pool with sea water , the private access to a very secluded beach and the possibility to moore your daily cruiser yacht right on the private dock of the villa make this property our premium choice of the entire Costa Smeralda.